Clean out your gutters. 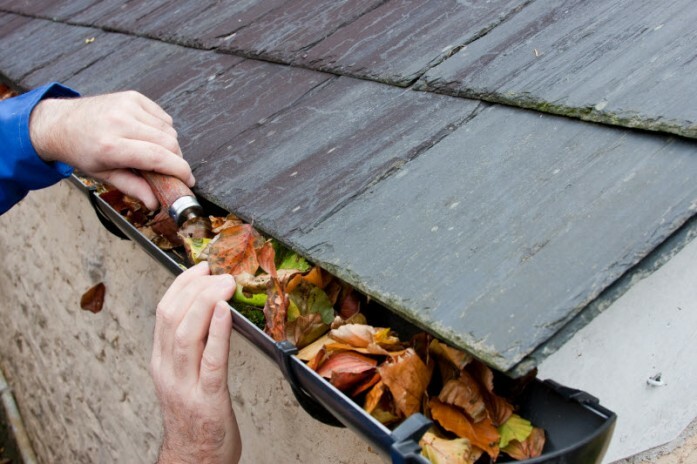 Remove leaves and other debris from your gutters first by hand to get rid of the large particles, and then with a scraping tool and water hose before cold weather arrives. This helps to prevent ice damming. Ice dams are caused when snow melts on a heated part of the roof, then refreezes on a colder portion of the roof. This creates a dam and allows water to back up under the shingles, causing damage to insulation and interior ceilings or walls. Make sure downspouts properly guide the water away from the home. AnEnvironmental Protection Agency technical bulletin recommends directing downspouts a minimum of 5 feet from the foundation, preferably 10 feet. Have your furnace and chimney checked and cleaned annually. Change your furnace filter regularly; every three months is typical. Vacuum out your air ducts. Every few years, the air ducts should be vacuumed to help make sure that heated air passes through with no obstacles. Keep cabinets on exterior walls with plumbing open to allow warm air to circulate. Similarly, keep bathroom and laundry room doors open to allow warm air to circulate. Remove screen windows and put up storm windows. Reverse the circulation of your ceiling fans. As you fire up the furnace for the heating season, reverse your ceiling fan blades to rotate clockwise, creating an updraft that forces warm air down into the room. This can provide additional energy savings, according to the California Energy Commission’s Consumer Energy Center. Prepare now so that you can stay warm in the cold winter months and protect your home from loss.